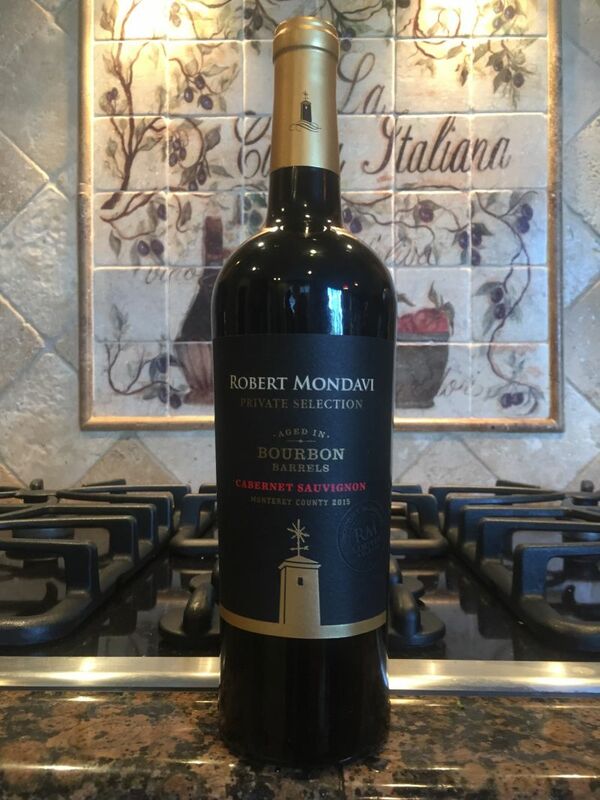 This week’s bargain wine is the 2015 Robert Mondavi Private Selection – Bourbon Barrel-Aged Cabernet Sauvignon. For an industry so focused on tradition, it was surprising to see a wine aged in such an unusual manner. Cabernet Sauvignon can be aged in used barrels, but the previous use is always aging wine. Until we found this bottle, I had never heard of a winemaker using a whiskey barrel. I knew that the type of barrel had a significant impact on the flavour of the wine. California Girl and I experienced this first-hand at Silverado Vineyards. The winemaker allowed us to taste the same vintage of Cabernet Sauvignon from American oak, Hungarian oak, French oak, and neutral oak. The term neutral oak is applied to used barrels that no longer impart flavour. The contents of each barrel tasted markedly different. The clause requiring new oak containers is believed to have been the result of lobbying from the lumber industry and the Coopers’ Union. Bourbon casks once used are often shipped East across the Atlantic Ocean to Scotland where they are used to age Scotch. 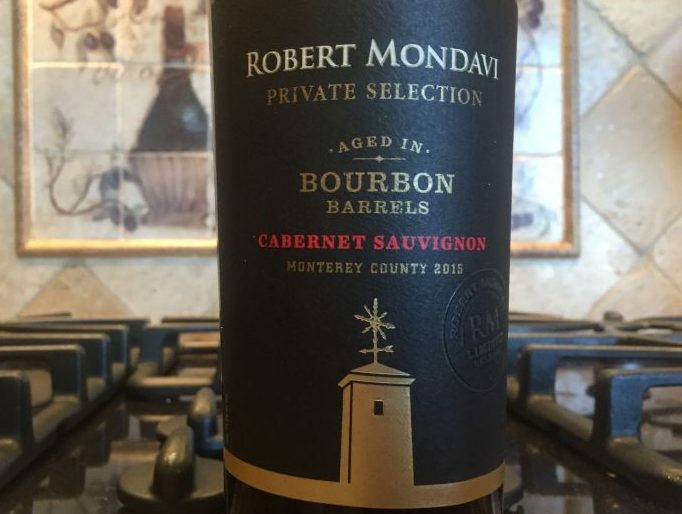 Now, it seems, some barrels are travelling in the other direction where they are used as part of the aging of Robert Mondavi Private Selection – Bourbon Barrel-Aged Cabernet Sauvignon. California Girl comments: I was really amazed at the nose on this wine. I could smell the pleasant Bourbon notes along with the deep cassis, plum, and a hint of vanilla. I wasn’t expecting much from this wine at its pricepoint, but I found myself excited and wanting to taste. The nose offered vanilla with a distinct hint of plum. The mouthfeel of the wine was soft, with no marked acidity. The tannins were astonishingly light for a Cab of such recent vintage. There was a flavour of blackcurrant and brown sugar. The wine was slightly on the sweet side, but in a way that felt harmonious and natural; in distinct contrast to the artificial tasting sweetness I have encountered in several cheaper California Cabernet Sauvignon. California Girl comments: I have to agree, the finish in the glass was a beautiful brown sugar flavor (without any sweetness) which was very impressive. This is a wine I would look forward to drinking as a Tuesday night wine. It is even nice enough to share with guests. It’s a real winner! I think that this wine would pair well with pork chops or a juicy ribeye steak. I suspect that the brown sugar and accompanying sweetness are a result of the bourbon barrels. Unfortunately, Robert Mondavi does not seem to sell a version of this Monterey Cab aged traditionally with which I can compare. They do use the same aging technique on their Monterey County Chardonnay. California Girl comments: We will be reviewing the Monterey County Chardonnay soon. I am excited to try that as this was so good. We paid $13.99 for Robert Mondavi Private Selection Bourbon Barrel-Aged Cabernet Sauvignon from Target. This is definitely a wine that California Girl and I shall buy and enjoy again. I have not had this wine, but have had the bourbon barrel Chardonnay. I have to admit, I didn’t like it. It took away from the “Chardonnay” Tough to explain. If I was blind tasting I would say it was Chardonnay, but it inhibited the fruit. Curious about this one though. I can imagine it being a better fit with Cab than Chard. I do enjoy this wine, never been a bourbon drinker, so I guess I was just curious enough to try, and am happy that I did. Hi Denice. I’m so glad you enjoyed this wine! If you like this, may I suggest 1000 Stories Burbon Barrel Aged Zinfandel? It’s Ah-Mazing! Cheers!